Whilst skiing off piste is exhilarating, the serious downside is the risk of an avalanche or snow slide. Knowing how to spot areas that at are risk, recognise when one is coming and how to deal with one if you are caught up in it, is vital. And if you are one of the first to arrive upon the scene of an avalanche, knowing what to do may help save people's lives - no small feat. It's also important to make sure you have the right travel insurance coverage for skiing off piste, as the costs of medical evacuation will be so much higher. Off piste skiing with a guide is included in our Winter Sports policies. If you plan on skiing off piste without a guide you will also need to add Sports Grade 4. 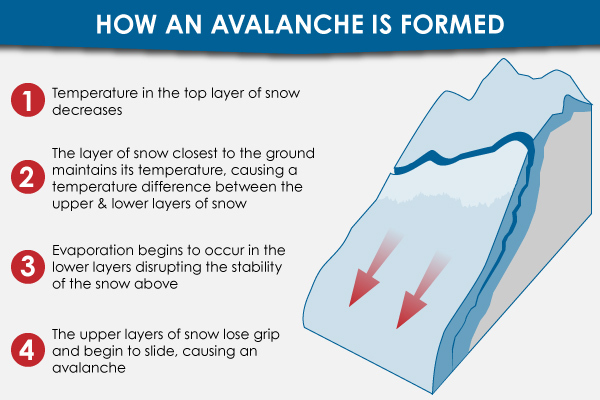 An Avalanche is a slide of snow that can start from one point, gathering speed and volume as it goes. The mass will contain not only snow, but also air and possibly ice, trees, rocks and other debris or objects that come into its path. They are frightening and extremely dangerous. Some avalanches have been known to reach speeds of up to 175 miles an hour. They are often spontaneously caused in storms that produce a lot of snowfall which causes an increased load, but they can also be triggered by changes in the snowpack such as melting, rain, rockfall, not to mention skiers and snowboarders themselves. 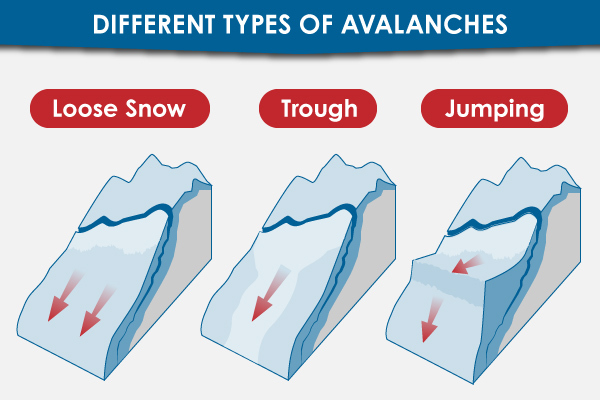 In fact the majority of avalanches in a recreational setting (i.e. resorts as opposed to residential areas) tend to have been caused by the people who were actually involved in the avalanche. Neil Reed, Communications Officer at the Mountaineering Council of Scotland, suggests that prevention is the best cause and counsels embarking on an avalanche course. An avalanche safety course will equip you with the skills to be able to assess terrain, and use tools to measure slopes that are questionable. You will also spot signs of avalanches in the past which can alert you to a high avalanche risk area. Any of these can hint at weaknesses in the snowpack. Skiing with a local is the best way to tap into local knowledge of safe and not so safe areas. But you'll gain a whole lot more from the experience and they'll take you to places you'd be hard pushed to find on your own. "At times of high avalanche risk, a north-facing gully might be highly dangerous while a south facing one is safe, and ridges generally tend to be safer than gullies. In short, even with forecasts, you require a fair bit of experience." If you are not skiing with a local, ask around for suggested places to avoid before you hit the slopes, and do your research via the net before you even arrive. There are three main ways you can get injured or die in an avalanche - from injury during the avalanche itself, hypothermia due to the cold or suffocation because of lack of air. Once buried, evidence points that you have about eighteen minutes. This is because in packed snow you will end up breathing in your own air, and therefore suffer carbon dioxide poisoning. 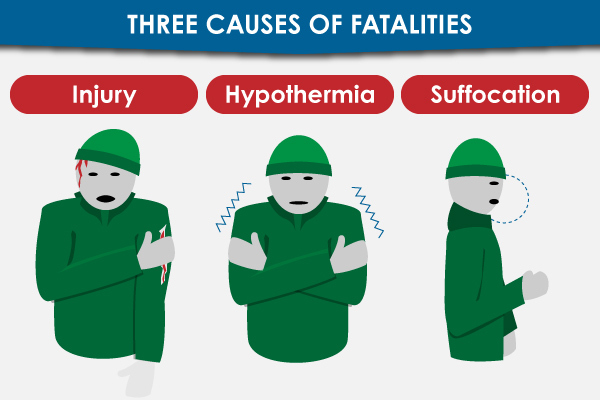 Even if you can reach oxygen outside, you may still succumb to hypothermia or shock so knowing what to do is important. It's important you try to get yourself out and up into oxygen as soon as possible. If you don't know which way to dig, spit and gravity will show you which way is down! Dig out an air pocket near your nose and mouth as the avalanche slows. Once the show has stopped moving do try to move if you can, and dig towards the surface. However, if you feel you are deep you are better off trying to conserve your air. Call out if you hear people but don't waste your air supply if you can't hear anyone yet. "The important thing is not to panic and wait: if you have your avalanche gear, people should find you"
Some skiers suggest urinating in the snow which can help rescue dogs to find you through the scent but the important thing is not to panic (this will use up more of your precious air) and wait: if you have your avalanche gear, people should find you. If you really are in a remote spot and know people are unlikely to get to you quickly, you will just have to dig yourself out as quickly as possible before the cold and lack of air kicks in. What's In An Avalanche Kit? A transceiver or beacon which sends a signal that alerts searchers to where you are buried. They can be analogue (a sound plus light) or digital (electromagnetic signal). Interestingly, the new digital transceiver don't identify victims so the rescuers have no moral deliberation about who to save. Digital beacons are said to be easier to use, although analogue have a longer range. Knowing both how to activate your transceiver as well as use it to find victims is vital before you hit the slopes so it is important to practise or even take a course. There is a location in Scotland specifically designed for people to practise learning how to use transceivers at https://www.glenmorelodge.org.uk. They all use the same frequency so it doesn't matter what brand you are using. You wear your transceivers in a special harness or strap over your body - against your chest and under your jacket. Obviously it needs to be on and transmitting to be of any use! These are basically long poles that can be fixed together to become even longer and these can help locate someone under the snow and show everyone where to dig. They can also measure the depth that people are buried at - vital as you'll need to know how wide a hole to make at the same time. When buying a pole, the longer it is the better. These are often made of smaller sections of probe that attach together for easier transporting, and come in a choice of aluminium or carbon. Aluminium is heavier and can work better in dense snow, whereas carbon probes are lighter to carry around. Just like a transceiver, practise getting your probe out of the bag and putting it probes together - if you ever need to use it, speed will be vital. "Plastic shovels are lighter, but aluminium shovels are stronger, choose one that suits you"
A shovel will help you to uncover trapped victims. Plastic shovels are lighter, but aluminium shovels are stronger and will help you shovel snow much faster. Choose one that suits you. If you're small you want a shovel you can use easily, not something you will have trouble wielding. Your shovel also needs to fit neatly into your backpack, along with your other equipment. Yet another reason to wear a helmet is that an avalanche will knock its victims over with force and maybe even propel them into a rock or tree. Trauma from an avalanche can be just a deadly as getting buried, so a helmet will be of great help here. If you feel yourself being dragged under a skier's air bag will inflate and can help keep your body towards the slope's surface and therefore less likely to get buried. They may also protect your body a little from physical trauma.They are relatively new items of equipment but gaining in popularity. We have mentioned the grim statistic that you will have around eighteen minutes before you start suffocating. The AvaLung lowers the likelihood of suffocation, taking the air from the snowpack through a mouthpiece, and diverting your carbon dioxide-rich breath to the snow behind you so you don't re-inhale it. It's basically an artificial lung and will increase the time you have before you start to suffocate, possibly up to an hour, as long as you have got the mouthpiece into your own mouth in time. Once again, it's important to practise, perhaps whilst running, so this becomes second nature to you. 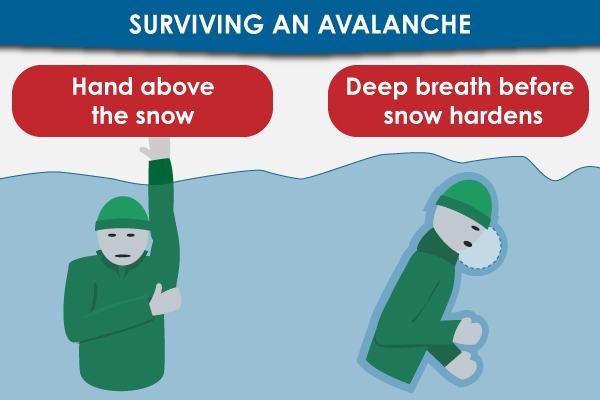 What To Do If You Arrive At The Scene Of An Avalanche? If you've seen the avalanche happen from a distance, do your best to watch people and track their progress. This sort of information could be vital in finding them later, but make sure you don't go anywhere near the slope until the avalanche has completely stopped. Be aware that you will need to build a hole as wide as the victim is deep. Call for help if you are sure they are there. Throw snow downhill. If you don't have a shovel use your skis or board to move snow. As soon as you see the victim, uncover their head and chest and begin CPR if necessary. If the victim cannot move on their own, do not attempt to move them until medical help arrives. If you do arrive on a scene, and the victim has an AvaLung, it is still imperative to get them as quickly as possible. Neil Reed is the communications officer for The Mountaineering Council of Scotland and has been walking and climbing in the Scottish Hills for over 45 years. The council runs courses on avalanche safety and you can find out more.